There are tons of different options available to Canadian gamblers in Microgaming sites, but the Jewels of the Orient slot machine is a one of a kind. Though the graphics are far from perfect and the features typical, it's a great way to pass some time. 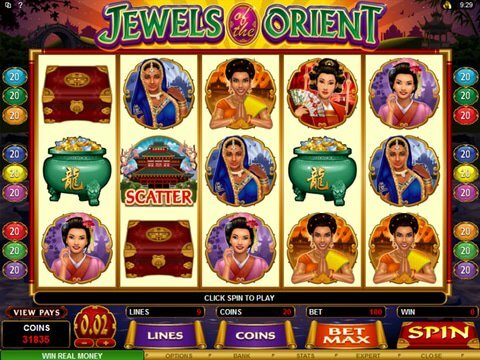 You can review it from your mobile phone or computer right here on this page with the no download, no registration Jewels of the Orient free play slot demo that is embedded here. This is a title that Microgaming has made for those who like to take small risks since the betting range runs only from a penny to $45, but with a jackpot of $12,500, the investment could definitely be worth it. You'll see ladies and precious gems on your screen, and three or more on an active line will produce a payout. Features include the Title Logo which is wild and will substitute for all regular icons as well as paying out when two or more are found on a line from left to right. There's also the Palace that can give you free spins and multipliers that vary based upon your selection. The maximum you can get is 40 with a multiplier ranging from 1x to 5x. If you like gems and jewels but you'd rather play for real money, then the Starburst machine from Net Entertainment is an all-time favorite. In this one, all you have to do is match three or more gems from left to right to win. There are wilds that can help you do this, and not only do they complete combos, but each one will grant you a re-spin. There's also a scatter that can pay out whenever two or more appear, and while it isn't frequent, it can help you add to your bankroll as you go.